Top ten facts and stats to know about Manchester City. | NUFC Blog. Top ten facts and stats to know about Manchester City. First off I would like to say sorry to anyone who reads the top ten pieces after I unfortunately had to miss the last two games. But today it returns, and just in time for the trip to Manchester City and is, as ever, jam packed with totally useless pub quiz facts about meeting between the two clubs for you to cast your eyes over. 1 – There is no better place to begin than looking at the record between the two clubs. From 162 competitive meetings between the two sides United have won 70, City have won 54 whilst there has been 38 draws between the two sides. Newcastle have not won in any of the last seven meetings between the two sides, with Micheal Owen netting his first goal for the club in our last victory at St James’ Park way back in 2005. United’s last win at City was way back in 2001/02 with a certain Alan Shearer scoring the only goal, which means that it has now been 17 visits since we returned home with 3 points. Mind you, it was the same for Everton, and it was 21 attempts since we beat Chelsea at Stamford Bridge so you never know. Despite enjoying a superior win record over City, our record in Manchester has brought just 16 wins from 74 visits with us suffering defeat 38 times. Not a happy hunting ground then…..
2 – Now we move onto notable former players and managers for both clubs. Where else can we start other than with Kevin Keegan, who took both clubs to the Division One title. It was then the turn of former Newcastle full-back, ‘Psycho’ Stuart Pearce, to give the City hot seat a go, whilst Joey Barton will surely be expecting a hostile reception from his old club. Former Toon players currently in the City squad include James Milner and Shay Given, whilst Craig Bellamy is also still on the City books but is currently plying his trade in The Championship with Cardiff City. Other notable former Newcastle and City players include Peter Beardsley, John Beresford, Ivar Brodis, John Burridge, Jeff Clarke, Mick Channon, Laurent Charvet, Andy Cole, Tony Cunningham, Wyn Davies, Sylvain Distin, Dietmar Hamann, Steve Howey, Darren Huckerby, Alan Kirkman, Gary Megson, Antoine Sibierski, Bobby Shinton, Ray Ranson, Imre Varadi, Tommy Wright, whilst Scott Sellars is currently head of the City academy. 3 – The two clubs have contested in two cup finals at Wembley with United lifting the FA Cup in in 1955. Jackie Milburn opened the scoring after 45 seconds, a record for quickest goal in an FA Cup final which stood until Roberto Di Matteo netted against Middlesbrough in the 1997 final. 4 – The second Wembley meeting was in the 1976 League Cup final, but unfortunately Gordon Lee’s United fell to a 2-1 defeat. The game is perhaps most memorable for Newcastle fan Dennis Tueart’s overhead kick which won the game for City. Alan Gowling scored United’s goal, whilst current academy coach Willie Donachie played in the game for City. 5 – Our biggest ever defeat at Manchester City is 5-1, which we have suffered 3 times at their old ground, Maine Road, in 1932/33, 1958/59, and 1974/75. At the City of Manchester Stadium, United have managed just two points from the last 18. City managed a 2-1 victory last time out with old boy Craig Bellamy netting the winner. Five players remain from the XI which started the game with Michael Owen, Damien Duff, Obafemi Martins, David Edgar, Sebastien Bassong and Geremi all having been moved on. On the plus side, the 3-0 defeat back in 2006 signalled the end of Graeme Souness’s tenure as Newcastle manager. 6 – United head into the game searching for their 80th away win in the Premier League from a total of 311 matches. If we could get that win it would take our total away points tally to 913. A victory would mean that our away form this season would equal that of the whole of our last Premier League campaign. 7 – Former Inter Milan manager Roberto Mancini is currently in the hot seat at Eastlands and boasts a win percentage of 54.05% with 20 wins from 37 games. Chris Hughton has a record of 61.02% after guiding the team to 36 wins from his 60 games as full-time United boss. 8 – City splashed an incredible £126m this summer compared to United’s modest £5m. Carlos Tevez is club captain for City and is top goalscorer for the club this season with four goals to his name. 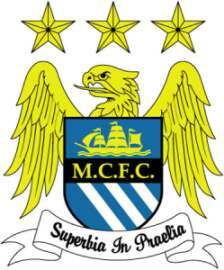 City are 4th in the table with three wins from six games, the three wins being against Liverpool, Wigan and Chelsea. A mixed start to the season has seen City draw at home to Blackburn and lose away at Sunderland. Whilst United have had a free week to prepare and recover from Sunday’s disappointment against Stoke, The Blues were in Europa League action against Juventus on Thursday night. 9 – United have managed just four goals at Eastlands since the club moved from Maine Road, and all the goals have come from our forwards with Shearer, Martins and Carroll all netting. 10 – Finally, the match day odds from Ladbrokes. Considering only our forwards have netted at the City of Manchester Stadium Andy Carroll is priced at 9/1 to be first goalscorer with Carlos Tevez 11/4 favourite. United are priced at 7/1 for the win whilst City are 2/5 favorites. A draw gives you odds of 7/2. James Milner and Joey Barton are priced at 8/1 and 20/1 to be first goalscorers in a battle of the old boys, whilst a repeat of United’s last away league game scoreline of 1-0 with Ben Arfa winner is a tempting 100/1. Top ten facts and stats to know about Wigan Athletic. Canny facts again Motty er paul :-), we’ll get something tomorrow cos I’ll be there ;-) laters lads. Tempted for a cheeky go on that Ben arfa bet. Good one Motty Reece I dont know about everyone else but I love reading your facts and stats, I always think its better to know lots of wee things about lots of things, rather than know everything about 1 thing, if that makes sense. Batty thinks I’m loaded big dave, proves what he knows. Welcome back, Icedog. How was France? Because I have no ambition big dave. WORKY,sorry i just cannot get my heed round froggys like,but the trip was good. WORKY have you any contacts in rugby m8 ? Jay Jay aslong as you have fun mate, did it not take ambition to become the Battlehill Bruiser ;) . Hole in the wall was worse big dave. Not really, Ice. Just music, gangsters, hooligans and reprobates mostly. Sorry to put a bit of a downer but realistically i think we are going to get raped tomorrow!!! Hope im wrong tho!! I used to think I was quite good at predictions, Toonsy, but that’s all gone to pot this season! Maybe we should get Midas Maynard back in? Dave, 6-Nowt against Aston Villa, 4-3 scorcher against Chelski, mullered by Blackpool and Stoke at home. I’d like to meet the person who could predict all that! I did predict that we’d be erratic to start with though, and that has certainly been true! I think that we are slowly coming into focus as Hughton builds a squad from the ashes. That’s normal though. Hold on, Icedog. Great things aren’t built overnight and sometimes the brave thing is to stick with something even when it doesn’t seem like the right thing at the time. I agree with Ice with the way we play at home as I said before its ok for away from home or against the top 4 teams but I dont think we should be playing like that against the teams around us. Batty I told Toonsy I think he should forget about a career in predictions. My bit on the Man City ‘blog. Batty I had a lot of work on this week I was on a couple of nights late on but no one was about mate.